Raise your hand if you love sriracha! It’s a pretty awesome condiment, right? 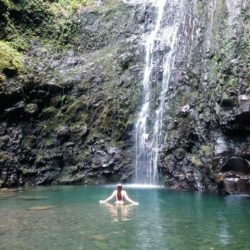 It can take a meal from alright to amazing in about three seconds flat. Some of my favorite foods to eat with are eggs, avocados, veggie burgers and stir fry. So much spicy goodness! Naturally I was stoked when I heard that was Blue Diamond’s newest flavor. A salty almond paired with sriracha sounded like my idea of the perfect snack. Honestly, they’re so good on their own that I had a hard time thinking of a recipe. There’s really not much that could make them taste any better. But between all of the cucumbers and basil that are currently taking over my patio, I thought they’d be tasty ground up in a pesto and stuffed into the middle of a bit-sized cucumber. 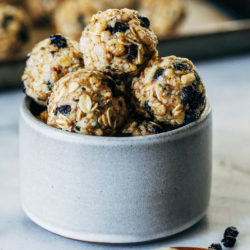 All you need to make them is a teaspoon or a melon baller to scoop out the center of each bite and a food processor to grind up the almonds and the basil for the pesto. The pesto is super simple too. I decided to add a bit of vegan mayonnaise to make it creamy, which I think pairs perfectly with the cool cucumber but you can use olive oil if you prefer. Other than that, the almonds are packed with so much flavor that you don’t need much else. I topped them of with a small slice of cherry tomato and some fresh chives to make them look pretty and that’s about it. 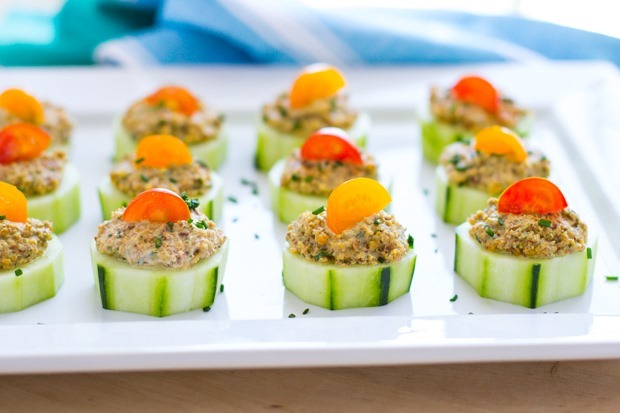 Just 15 minutes for a cute summer appetizer packed with sriracha flavor. I hope you guys get a chance to try those almonds because I honestly think you’re going to love them! 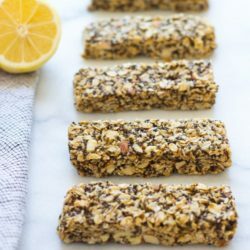 They’re a great option for a healthy snack and they’re seriously addicting! 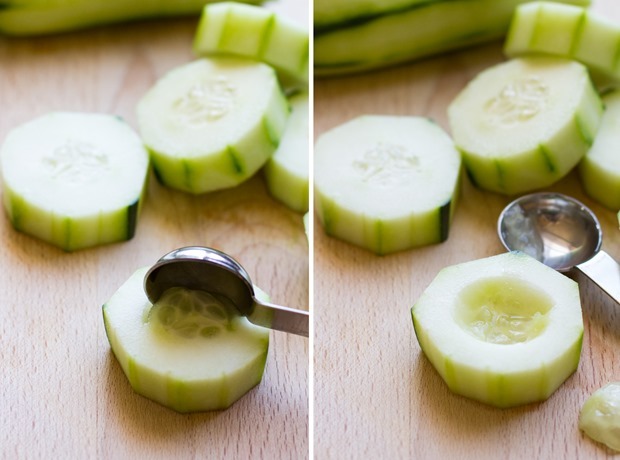 Using a teaspoon or a melon baller, scoop out the center of each cucumber. Be careful not to go too deep or the filling will fall out of the bottom. 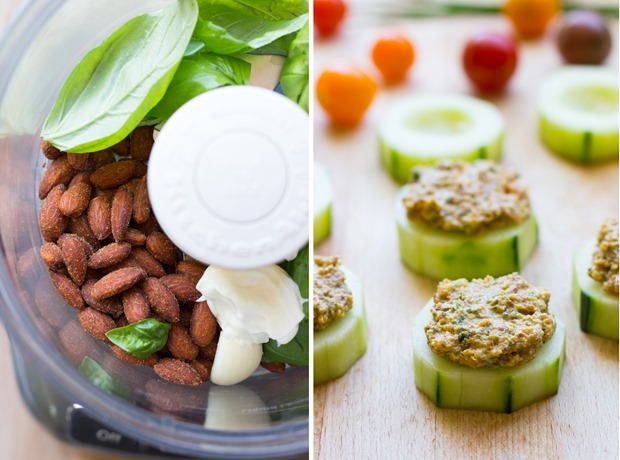 Make the pesto by combining the almonds, basil, garlic and mayo in a food processor and blend for 15-20 seconds. Spoon a heaping teaspoon of pesto into each slice of cucumber then top with a small piece of cherry tomato and garnish with chives. 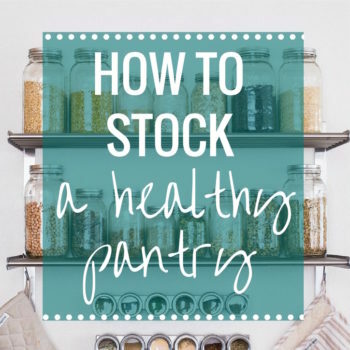 Serve immediately or refrigerate for up to 1 day. This post is sponsored by Blue Diamond Almonds but all opinions and text are my own. Thank you for supporting the brands that help make this site possible! So good! 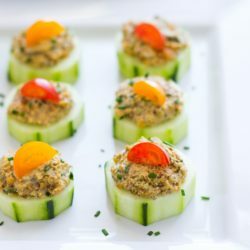 I love those sriracha almonds and cucumber bites seem like the perfect snack! Thanks Kelly! I hope you’re having a great weekend! What a fun, fresh party app! Ahhh these are the cutest little things! And what a great idea to use them in pesto. Sriracha anything is ok in my book. Yum! Get in my belly!! Love sriracha, seriously, what did we do without it? 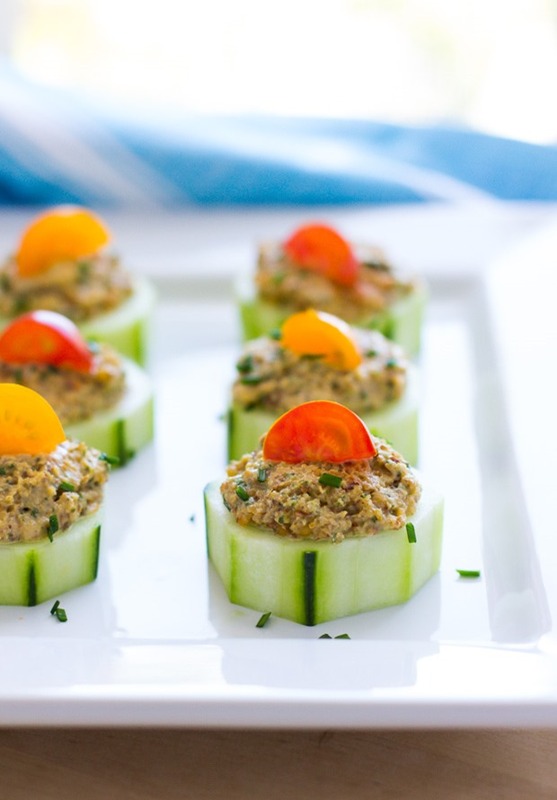 What a great summer appetizer, light enough but super filling from the almonds!! They are surprising filling! Thanks Sam! What an adorable appetizer! 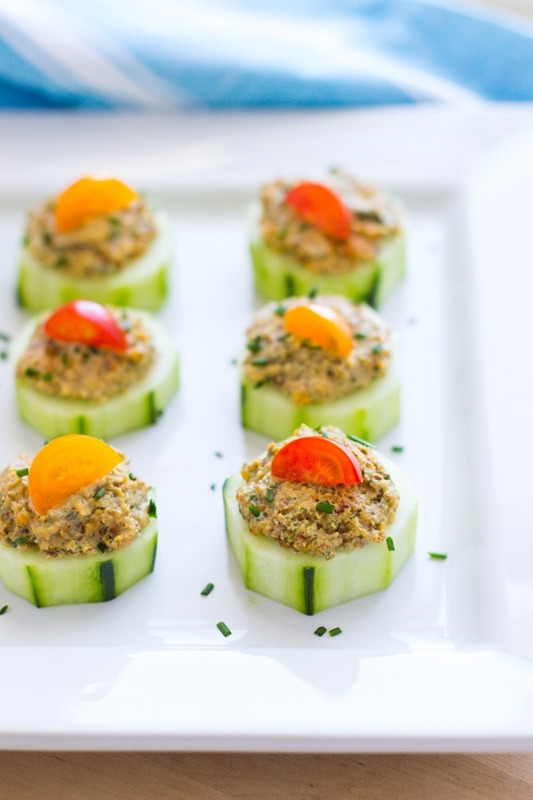 Love finding new healthy finger food recipes. 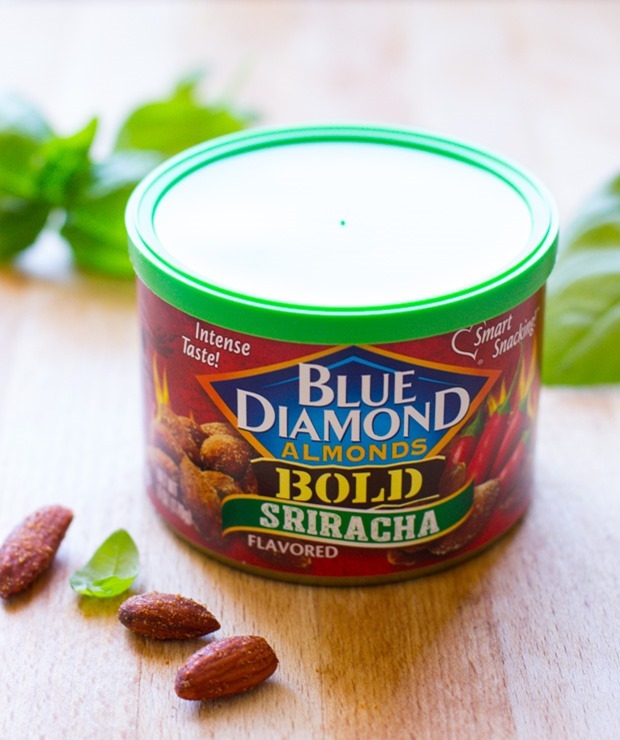 I love love love sriracha and those Blue Diamond sriracha almonds are totally amazing! Great idea! Oh my goodness, this is the BEST idea Sarah! I love these little bites and they are perfect for a summer party on a hot day. Plus, who doesn’t loveeee Sriracha?! 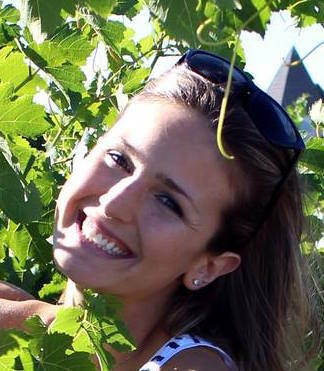 When I visit Napa next (I’m thinking maybe my 31st birthday in January?!) I expect you to deliver these to the first winery we visit ;) Hehehehe! how creative! I love how you used the sriracha almonds in the pesto! Thanks Rachel! They add so much flavor! Your pictures…like, I can’t. This is the cutest appetizer I’ve ever seeeeeeen! Making STAT. Mmm, sriracha is the best! 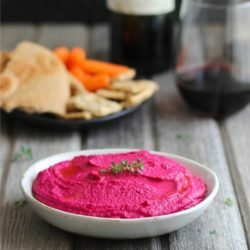 I love that you used sriracha almonds to make a pesto – that’s such an amazing idea! 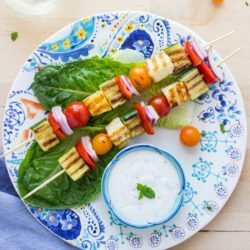 These look so beautiful and perfect for a summer bite!